The Tale of Peter Rabbit was the first, and arguably best-known, of 23 tales published by Helen Beatrix Potter (1866-1943) between 1902 and 1930. 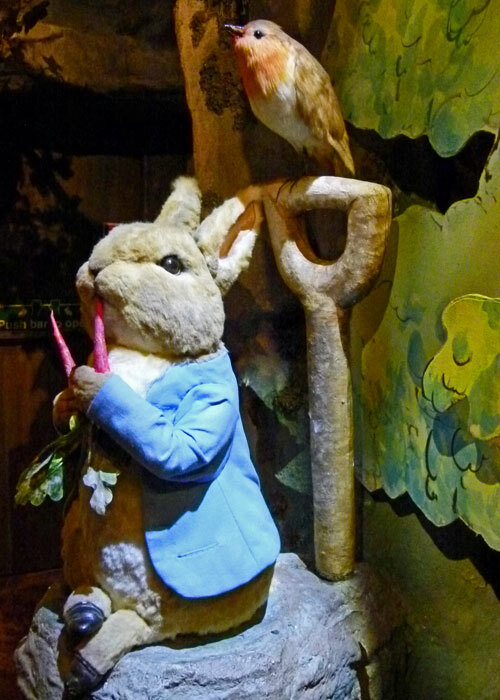 The plot, which has more twists and turns than an arrow in flight, features a greedy bad bunny (Peter) who, ignoring maternal instruction and eschewing the company of his more well-mannered siblings (Flopsy, Mopsy and Cotton-tail) as they gather blackberries, recklessly breaks into the garden of an elderly man (Mr McGregor). 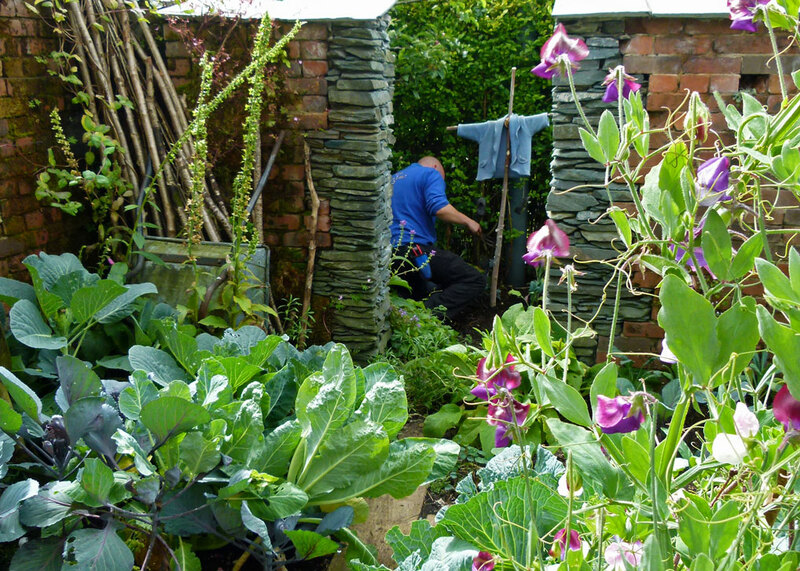 Here, Peter callously wreaks havoc on the lettuces, French beans and radishes that poor McGregor has spent so long cultivating for himself and his wife. Deservedly suffering a dyspeptic event next to the cucumber frame as a consequence of his gluttony, Peter is discovered; but, younger and fitter than his vulnerable pensioner adversary, and in keeping with his feral nature, he manages to escape – though loses his best blue jacket in the process and is forced to drink camomile tea. Cinema and Potter fans alike were no doubt delighted when this dark, violent, but ultimately morally uplifting, tale eventually made its way onto the silver screen. Peter Rabbit (the movie) is a live-action computer animated production which attracted some controversy on its release in February 2018. Some suggest the film portrays Peter as an irresponsible bully. The critics, interpreting the original Tale of Peter Rabbit as a simple children’s story about an innocent, fatherless, cuddly little coney driven to juvenile delinquency through poverty and boredom, feel that Beatrix Potter would be spinning in her grave at the misrepresentation. Only having seen the trailer, in which Peter comes across as a perfectly conventional gobby brat, there actually seems little in it that would offend your average Teenage Mutant Ninja Turtle fan. 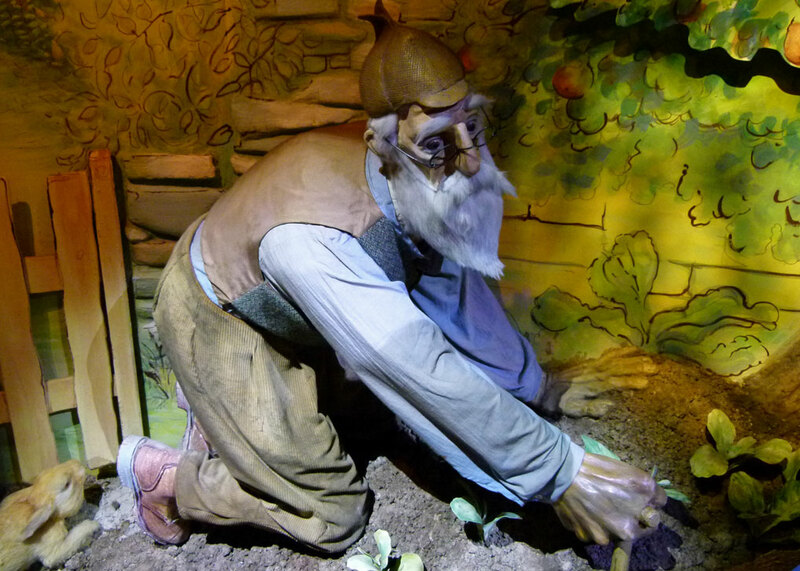 James Corden, who voices the bumptious buck, is reported to have spent time in a hutch on a diet of carrots and lettuce to get into character for the role. 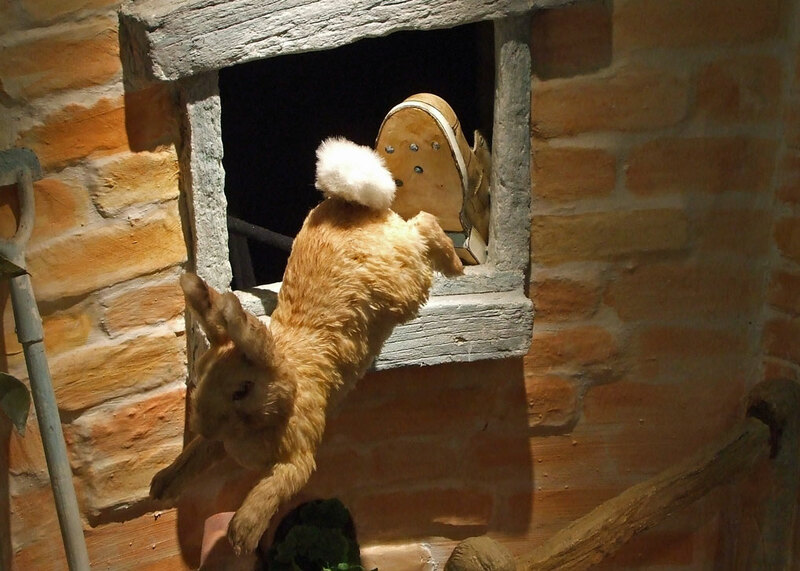 Another way of getting close to the Peter Rabbit experience is to visit the World of Beatrix Potter in Bowness, by the shores of Lake Windermere in the English Lake District. The Lake District is, of course, Beatrix Potter Land: her house, Hill Top, is across the water at Near Sawry, many of her original drawings can be seen at the Beatrix Potter Gallery in Hawkshead, in her husband’s former offices, and she left most of her estate, including 4,000 acres and 14 farms in the Lake District, to the National Trust in her will. Regardless of any charm in her drawings or literary merit in her stories (and I confess they don’t do it for me) the Beatrix Potter brand is big business. Huge. She is also surprisingly popular in Japan, because – I’m told – her books are used to help learn English; the mind boggles. 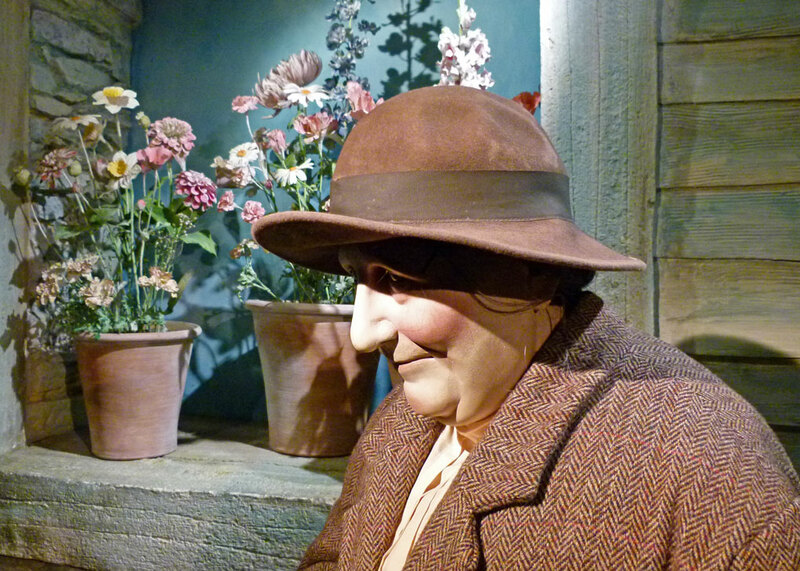 Anyway, for a special treat, and ignoring the fact that Bowness is a tourist magnet and therefore invariably rammed with visitors, one day Mrs Britain took me to the World of Beatrix Potter. Perhaps she additionally thought that Peter Rabbit would be a good topic for our local book group discussion. It is of course always possible that we were accompanied by some younger, smaller, people as well. 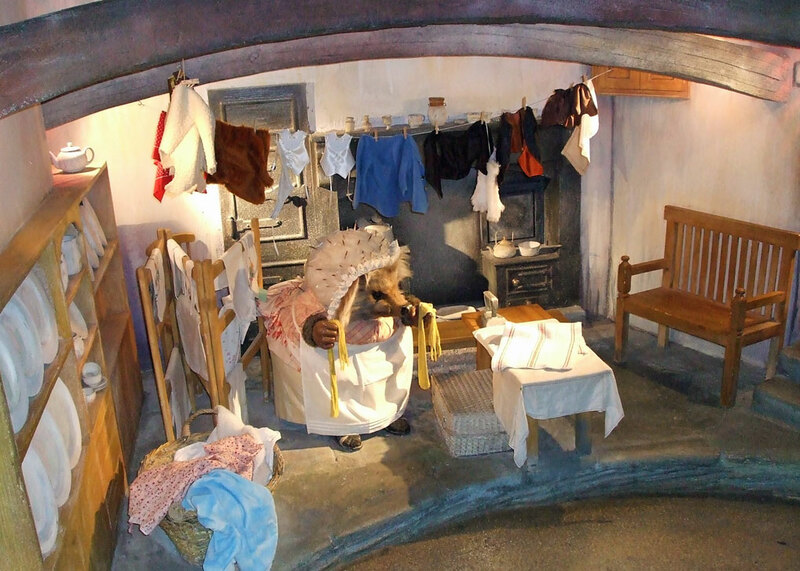 As you’ve probably guessed, the World of Beatrix Potter is an attraction primarily aimed at a younger clientele; and at Japanese of any age. 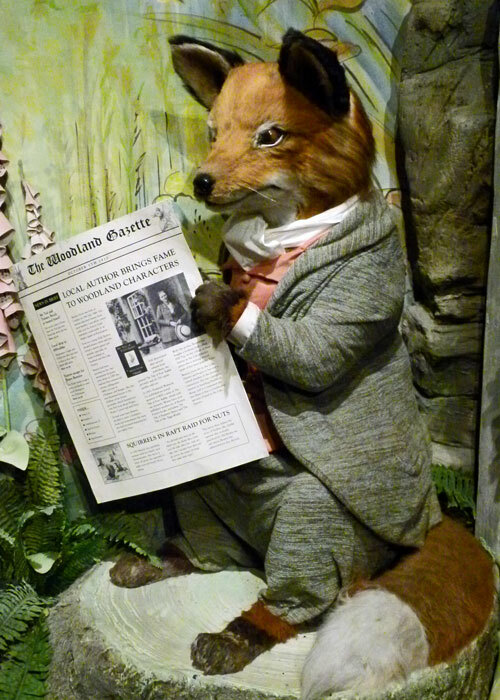 When I say ‘young’ I can’t see older children getting terribly excited by it, but some adults will coo appreciatively and find an interesting exhibition about Beatrix Potter at the end. 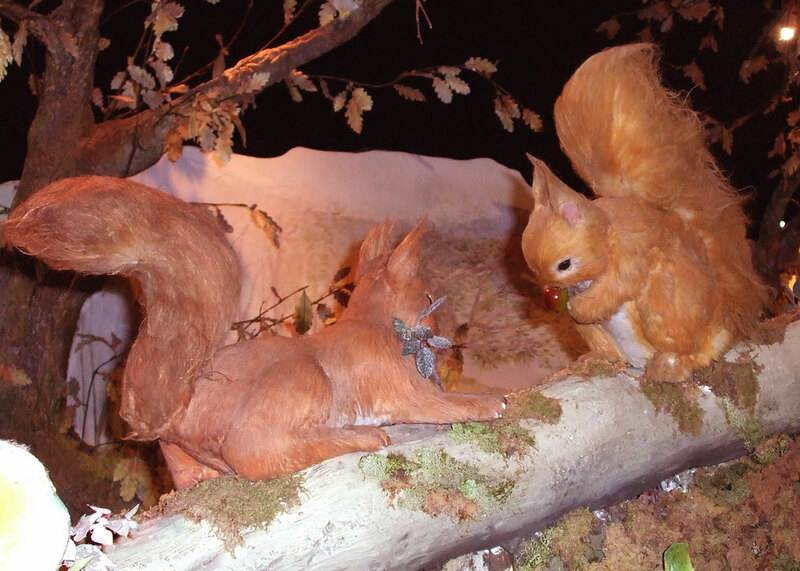 The experience kicks-off with a short introductory video in the world’s cosiest cinema, followed by an indoor walk through life-size (a relative term, I know) recreations of scenes from Beatrix Potter’s stories, complete with many of the much-loved characters. I assume they have been stuffed. But if anyone harbours a lifelong ambition to meet Jemima Puddle-Duck, Mrs Tiggy-Winkle, Tom Kitten, Squirrel Nutkin, Peter Rabbit (of course) and all the rest, this seems to be the perfect place to realise it. Outside, there’s a very small Peter Rabbit garden. It’s all very cute and, to be fair, quite well done. 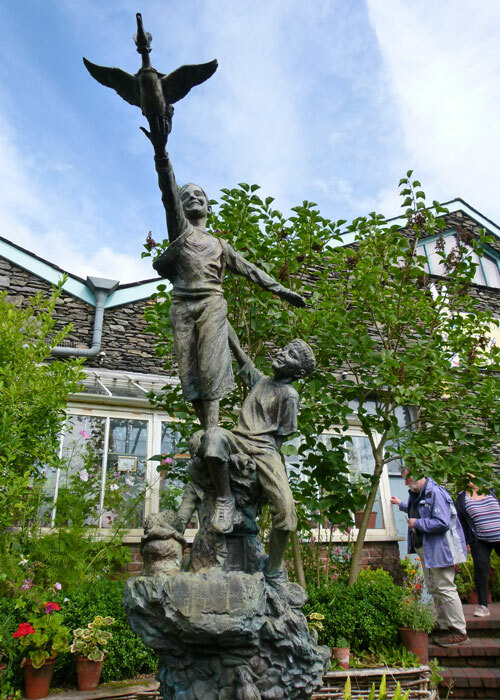 In the garden is a 15 foot (4.5 metre) high bronze statue depicting three children launching Jemima Puddle-Duck into the air like an unwieldy toy glider, and featuring characters from all of BP’s stories. The statue was unveiled in 2006, an event attended by fragrant US actress Renee Zellweger, who starred in the film Miss Potter, released that year. Renee said, apparently without a trace of irony, that she hoped the statue would become “a distinctive local landmark”. And I’m sure, if it were ever placed where everyone could see it, it would. 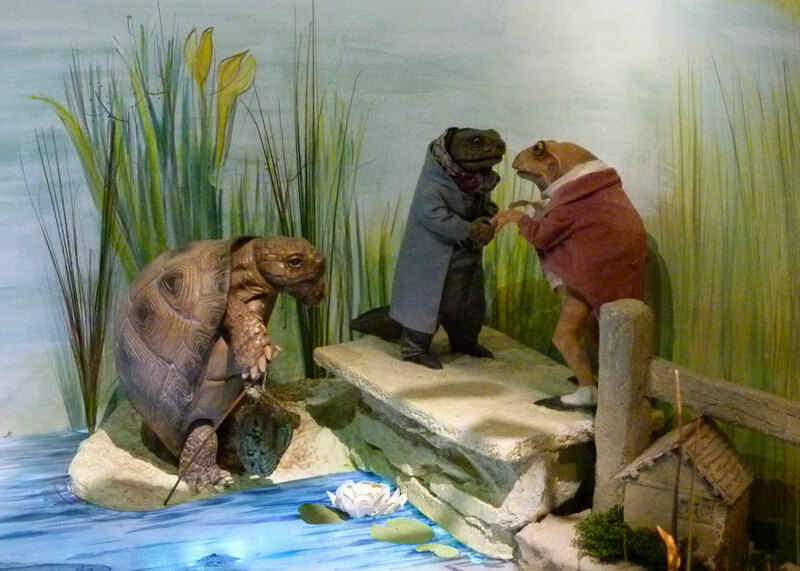 Inevitably, at the end of your tour, you will rejoice in discovering a Beatrix Potter shop selling branded merchandise for outrageously high prices, as well as – oh, joy! – a Beatrix Potter café. Exhausted after an hour of talking with fictional characters (conversations tended to be a little one-sided), and taking photographs of Japanese tourists, we trooped in for refreshment. Imagine my disappointment, and surprise, to discover that rabbit pie with vegetables, all fresh from the garden, were not on the menu. There wasn’t even a nice crispy duck. Sighing at the lack of business nous, but mollified by the splendid staff, we settled for tea and buns; and very nice they were too. Spot on, I couldn’t have put it better myself! Have had horrors at the stills from the film and can’t bear even to look at the trailers. I don’t like models or ‘worlds’ but was charmed by the photograph of a real garden with the little blue jacket in it. I may knit one for my allotment. Well of course, you had me laughing all the way through this post. 😀 I’ve heard “Miss Potter” is a good movie, but haven’t gotten around to seeing it yet. 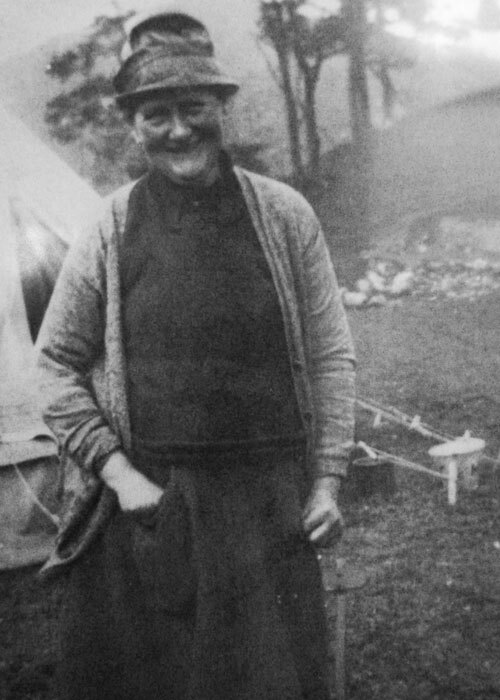 I do admire Beatrix Potter and the way she soldiered on after her fiance died. Also, she was such a benefactor to the country by leaving all her land to the National Trust. I don’t think I read the Peter Rabbit books as a child, although I certainly knew about Peter Rabbit. When our son was a baby, I collected the story books, and I still appreciate them for the charming watercolor illustrations Beatrix did. Sounds like you had an interesting outing with Mrs. Britain and the little people. 😉 Have a great week! Oh my gosh, Mike – I was reading this while all bundled up with the cats and your writing made me laugh and laugh until finally Moxie gave up in disgust and Got Up. Even Della is looking at me through narrowed eyes. Friends took me to her house and I must admit that I enjoyed myself! Ah – Peter Rabbit! Such good memories. Those are absolutely memorable first lines. I think everyone I know cut their teeth on Beatrice Potter. I’d go to see that world that recreates her famous story because I’ve known those characters all of my reading life. I think you must thank Mrs. Britain. I was more of an Ian Fleming man, really. 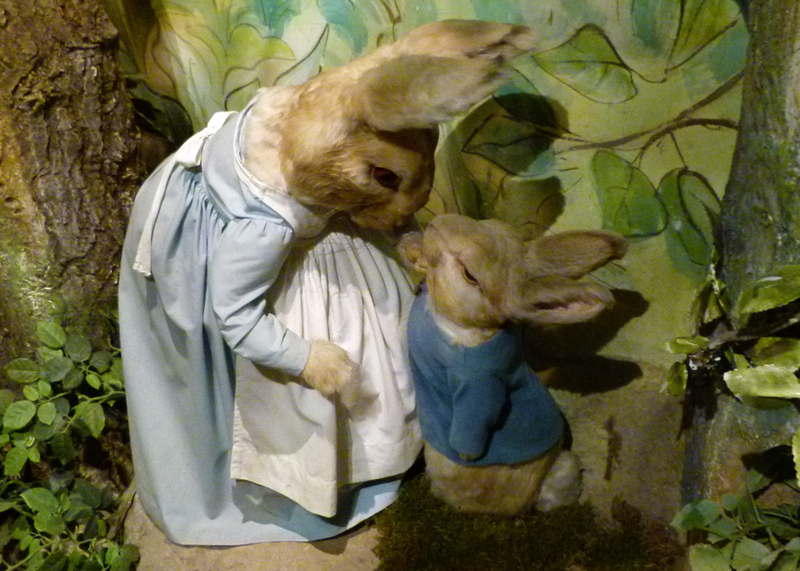 Let me show you how entrenched Beatrix Potter was entrenched in my Australian childhood. When the family cat had four kittens in 1953, we called them Flopsy, Mopsy, Cotton-tail and Peter. Ah – they would have been the long-eared, bobbity-tailed variety of Australian cats? Well I just learned that my favorite, Samuel Whiskers and the Roly Poly Pudding is also my friend Carla’s favorite! And I wonder how often the Japanese ESLers use the word ‘soporific.’ I probably won’t be going to see the movie, and don’t really like any but the original stories. I think that computers are going to be responsible for kids born in this century to have a hard time differentiating between fantasy and reality. Computer-generated graphics are incredible. I have a hard time differentiating between fantasy and reality myself sometimes. Thank You! I am a fan. My boys love the story of Samuel Whiskers, it is our family favorite. Another splendid post, Mike. I love the way you stuff your tongue so firmly in your cheek and keep it there whilst typing! I really appreciate the fact that you appreciate it’s tongue in cheek, Frank! I enjoyed this post very much! Oh, what a cynic you are! I liked the stories very much when I was small (especially Mrs Tiggy-Winkle) and I read them to my daughters when they were young but I think I will give the film a miss. I have no grandchildren to take with me in any case! I have still got all my Beatrix Potter books in a shoebox somewhere. My favourite was the Tailor of Gloucester. Oh, I would have served up the “Puddleduck,” a rich, fragrant duck stew served in a puddle of delicious brown gravy! Or perhaps the Squirrel Nutkin — a squirrel-shaped cookie filled with nuts and chocolate. Or the Benjamin Bunny Salad. If you’re going by train, Jeanie, you can get one from Oxenhomlme Lake District to Windermere – but then you’ll need to get a taxi to Bowness. 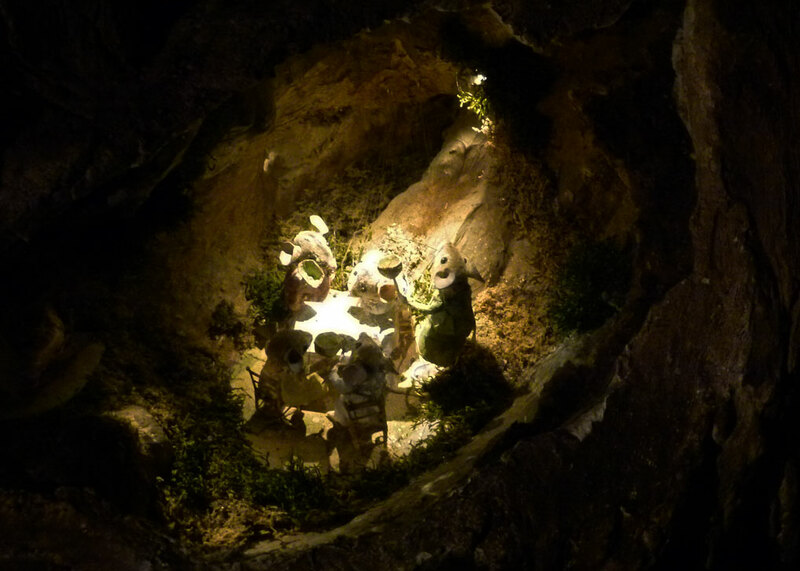 Personally, I wouldn’t think it worth going out of my way for the World of Beatrix Potter alone – think about taking in Hill Top and Hawkshead too while you’re there; but you’d probably need to do this by car, or as part of a tour. Honestly, what isn’t a tourist trap these days? It is very difficult to travel much and not find yourself in a gift shop or cafe that is almost always disappointing. I’m glad to hear that you enjoyed your tea and buns though. As a child, I read “Wind in the Willows” and “Winnie the Pooh” but I really don’t remember seeing any of Potter’s books around. I was familiar with the story, but only vaguely… I don’t imagine the writing would do much for me now, but I still love reading A.A. Milne and own all of his works. I did find a complete Potter collection at a garage sale, and I nearly picked it up, just for the very charming artwork. I do hate what they’ve done with the modern Pooh Bear though, and a quick look at this trailer leaves me thinking it will have none of the charm of the original work. He was a bad little bunny and the latest movie probably comes close to how he was. I love the illustrations, the stories, not so much. A lovely post Mike. Just in case you are not aware, we mention in The Magnificent Seven https://derrickjknight.com/2013/04/07/the-magnificent-seven/ ‘The Beatrix Potter Connection’ with Brompton Cemetery. Miss Potter lived as a girl in the fashionable Kensington of the 1870s and it is claimed that several of her characters’ names are taken from the gravestones in the cemetery – Nutkins, Mr McGregor (sic), Peter Rabbett, Brock, and Jeremiah Fisher are examples. The cemetery’s high walls could have been an inspiration for Mr MacGregor’s garden. You are accurate about all things and such a funnybunny especially re the Japanese. I had the books given to me but wasn’t keen on Peter Rabbit. I was rather fond of the Jemima Puddleduck story though, it must be a girl thing. I suppose the cafe has no such scruples about selling produce grown by an overworked and harassed old pensioner. Life is not fair. Hmm… not sure I’d like that movie, but as Peter and I both love the same colour for our clothes, we do have something in common. Haha! What happened, in the end (to Peter Rabbit)? Yes, I haven’t read it…the movie trailer looks a blast. He had camomile tea. I can’t wait for Peter Rabbit II…return of the bunny. I’m trying to make my mind stop thinking about Peter Rabbit cooked and on a plate, although I do have plates with Peter Rabbit on them. Thankfully I didn’t have to pay a fortune for them. This is another place I’d like to visit. We read many of Beatrix Potter’s collection of books to our kids when they were little. My kids had them too; I was never much of a fan myself. As the mama of two (now grown) daughters, we lived and breathed Ms Potter’s tales for years. I’ll be passing your blog along to them as they will probably be wanting to book a trip to Bowness! I read the Beatrix Potter books as a child, and in fact, I admit to still owning them. Not quite sure why. I went to see the Peter Rabbit film with my 10 year old grandson…. we both loved it. Those bunnies were REAL I tell you! But our hero Peter did come off as a bit of a rabbity jerk, but of course, all was well in the end and he learned his lesson. Ah Mr. Britain, you crack me up! That title alone! Beatrix Potter passed me by as well, as did all the children’s classics. I’ve never read Swallows and Amazons, Alice in Wonderland, Black Beauty or Treasure Island. I went straight from Enid Blyton to Agatha Christie, which makes me think that perhaps I should give the juvenile delinquent a go. Must admit, I used to enjoy Arthur Ransome’s stories. Yes, I can see this being a tourist trap! I’ve never actually read the story. I wonder if the Japanese are drawn to Anne of Green Gables for much the same reason. I want to go there! My son did love the books and I would not touch anything other than the original script and drawings. What a very modern story Peter Rabbit is – one parent family, mother struggling to cope with father dead because of his criminal lifestyle! My daughter was travelling when the film Miss Potter first came out and having just arrived in a new city decided to go and see it to cheer herself up – not realising there would be death and tragedy with the sudden demise of Miss Potter’s first fiance!